In case you hadn’t guessed, that ‘future’ bit simply means that it has a Wi-Fi connection for waking you up with more than just a clanging bell. One of the first nations to sample the Chumby will be Japan, where it hits bedroom dressers across the land in October at an eyebrow-raising (for an alarm clock) price of ¥29,400 ($300). Far-East marketing will be handled by a company with an almost equally odd name, Zyyx Inc, and it’s encouraging to see that it has taken advantage of the device’s flexibility to allow users to customize it for the sophisticated Japanese market. As well as the usual YouTube videos, Twitter feeds and the like, the Japanese Chumby is able to pull content from Mixi, the giant Japanese SNS, and news from local sources on Sumo, J-Pop and (probably) giant monster attacks on Tokyo – whatever you fancy, really. 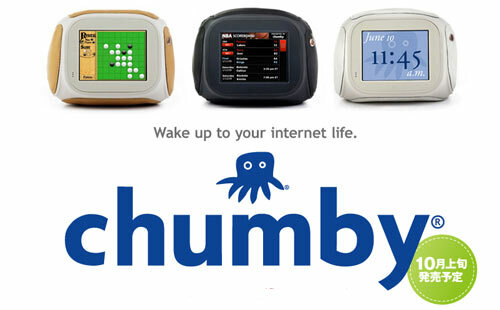 If you’re outside the US and Japan, then never fear – Chumby’s makers say they’re in talks to bring the touchscreen device to Europe, Australia and Hong Kong soon.